The job of a service dog is not an easy one; only about one in every three dogs we start in the program will ultimately end up in a successful partnership with a Veteran as a working service dog. What are the characteristics of a good service dog? confident near traffic, when walking on different surfaces, and navigating many different types of doorways, stairs, elevators, etc. How many dogs do you know who have all of these qualities? This is why it takes a long time, a lot of training, and a very special dog to begin with to become a Hero Dog. Why don’t some dogs complete the training program? The most common reason that dogs are released from the program is physical health. If a dog has a medical condition that requires complex, expensive, or life-long treatment, he will be released from the program. 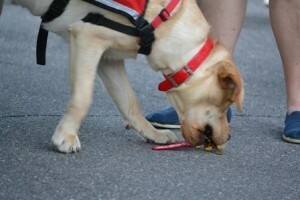 Service dog work is physically demanding. It would be inhumane to ask a dog with a skeletal or structural problem to perform the tasks required of a service dog. Therefore, dogs with conditions such as hip dysplasia are also released, even though the dog may have no symptoms. The next most common reason dogs do not complete the training is confidence. Service dogs must work in very challenging environments involving close contact with strangers, large crowds, traffic, travel on public transportation, machinery, noises, and all manner of novel objects. Most dogs justifiably find these things frightening, and despite extensive socialization and training, some dogs will simply find it too stressful to deal with these types of environments on a daily basis. 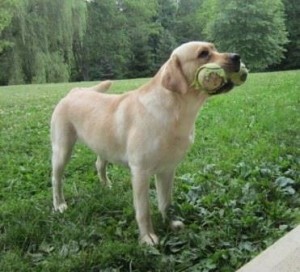 The third most likely reason for a dog to be released is that he is too active, energetic, or reactive to new things. Despite the fact that a service dog is trained to do many tasks, a good portion of his job involves simply waiting quietly at his partner’s side. Additionally, the dog may be paired with someone who has no ability to physically control the dog in any way, so the dog must be calm and attentive enough to be under verbal or hand signal control only. What happens to dogs that don’t complete the program? If a dog is released for a serious medical issue, he is offered for adoption as a pet. Usually the puppy raiser has first right of refusal, but this is not guaranteed. Our priority is finding the best possible home for the dog. If a dog lacks the confidence or demeanor to fulfill the public access role of a service dog, we may try to match him with a Veteran whose needs can be met within the home or who largely needs a social support dog. This dog will not be a service dog, but can certainly be of tremendous value as a pet and an in-home companion to a Veteran. We may also look for other placements that suit the dog’s temperament and abilities, such as a detection dog or search and rescue dog. If none of the above options is viable, then the dog would again be offered for adoption as a pet; we will find the most suitable adoptive home in which to place the dog. Many of our released dogs who have returned to their puppy raisers or who have been adopted are now volunteering as therapy dogs and are working to bring comfort and companionship to retired Veterans and military families. We do not currently have any available dogs for adoption. Subscribe to our newsletter to receive announcements when a released dog is available for adoption.